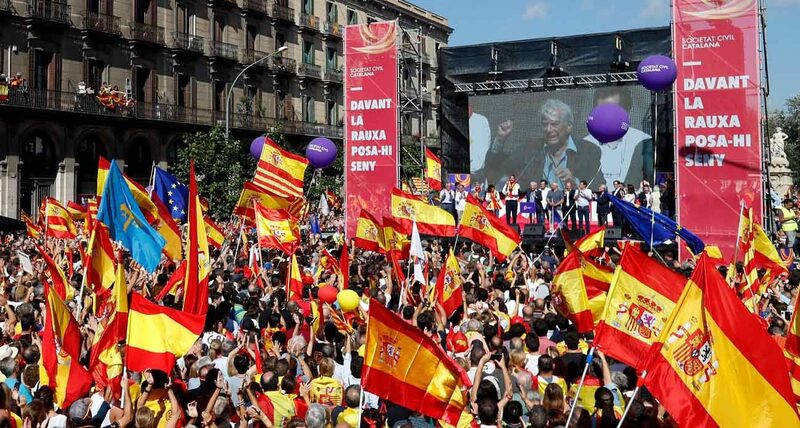 MADRID (CNS) — A Spanish cardinal defended his country’s unity as a “moral good” and condemned “sedition and fraud” by secessionists, as politicians in Catalonia prepared to debate independence at an Oct. 10 regional parliamentary session. The cardinal’s comments appeared in a newsletter circulated Oct. 7-8, as hundreds of thousands of Spaniards in Madrid, Barcelona and other cities rallied against Catalan independence. “Catalonia cannot be without Spain, nor Spain without Catalonia — this is what constitutes the unity of Spain,” said Cardinal Canizares. Catalonia, the wealthiest of Spain’s 17 autonomous regions, is home to 7.5 million people with its own language and culture. Regional officials said 90 percent of voters backed secession Oct. 1 after a 42.3 percent turnout of Catalonia’s registered voters. The head of Catalonia’s government, Carles Puigdemont, said regional legislators would meet Oct. 10 to consider results of the independence referendum, which sparked violence after being declared illegal by Spain’s Constitutional Court. However, Spain’s deputy prime minister, Soraya Saenz de Santamaria, warned Oct. 9 the Madrid government would “take all necessary measures” to “restore law and democracy” if Catalan legislators declared independence. A Catholic news agency reported Spanish Prime Minister Mariano Rajoy met Oct. 3 with Madrid Cardinal Carlos Osoro Sierra and Archbishop Juan Jose Omella of Barcelona, capital of Catalonia, in a bid to enlist church support for national unity. Other Spanish bishops also criticized the split, but two Catalan bishops did not. “I admire the courage and peaceful resistance of those who defended this legitimate exercise of our people’s right to self-determination, and I condemn all violent acts, especially those committed by ‘public servants,'” Bishop Novell said in a statement on the Barcelona archdiocesan website.